An edit (AKA diff, change) is a special type of reply that indicates a set of suggested changes to the post it is replying to. A collection of (presumably related) suggested edits in open source is often called a patch or pull request. Reasons why you should publish edit posts, and support having a reader show them. Each of these are use-cases of their own merit. 7.2 reuse structure from Micropub? E.g. 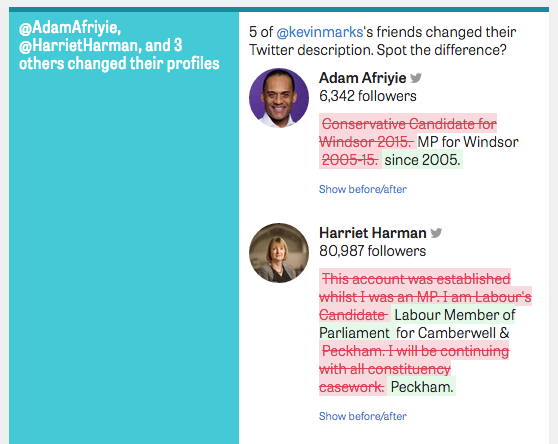 edit a Wikipedia page by posting an edit on your own site, and notifying the original. Notify the original page about your edit response by sending a webmention to Wikipedia. Wikipedia verifies the webmention and accepts the edit as being authored by your personal domain, like the User: domain accounts we already have here on IndieWebCamp (e.g. User:Tantek.com). This is very similar to the existing git model of making a pull request from your own fork of a repository, and having that pull request automatically accepted because a repo policy. While the above user scenario with Wikipedia is hypothetical and would require Wikipedia and thus MediaWiki to support receiving webmentions from edit posts, and understanding IndieWeb identity, there is something we can do first to prove it can work. a u-edit-of hyperlink to the version of the page you're editing. Notify the original page about your edit response by sending a webmention to IndieWeb.org (which already supports receiving webmentions, just doesn't do anything with them other than share with Loqi thus to IRC). And presto, you can edit IndieWeb.org without ever logging into it. Why support receiving edits from others to your posts? If someone you know and trust to edit your posts sends you an edit reply to your post, it would be nice to be able to automatically (or semi-automatically with a single "Accept" button click) to have those edits incorporated into your post, and somehow cite the edit post as having contributed. This would require that the edit operations themselves (insertions, deletions, replacements) be explicitly marked up in a way that was automatically machine processable. Why show edit posts in your reader? By implementing the consumption and display of edit posts in your reader, you can view edits made by your account on another site, or edits to a particular page, or even all edits to a wiki. E.g. if third party wiki commons (like Wikipedia) supported marking up their edit permalinks as edit posts, and in their streams of edits as well, it would be possible to follow/subscribe to them in an indie reader and see your edits on another site show up in the stream of posts in your reader. Why publish edits you would otherwise publish elsewhere? The idea was discussed in 2014, and again in 2018 regarding the posting of git/code diffs in a post as a way to create a lightweight pull request. The post could contain web action tags to trigger some kind of diff handler to open and inspect diff in the correct repo using git. Despite the difference in UI for those special "edit" posts, it may be worth using a single unified "edit-of" markup model for them. See the brainstorming section for more. We haven't quite figured out the "how" of a good way to markup edit posts. A good start seems to be to write an "edit" like a reply, but with class="u-edit-of" instead of class="u-in-reply-to"
The details of how to markup the diffs (deletions, insertions, replacements) of an edit are still being figured out in the brainstorming section. "e-diff" - presumably instead of "e-content"
On Facebook, edit posts can be some of the most popular posts, e.g. In each of these cases, such posts typically generate numerous responses (e.g. likes and comments), far more than the average on that person's other posts. 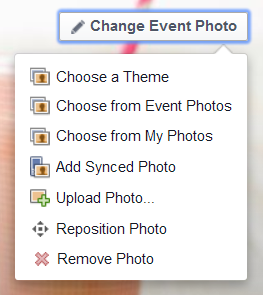 While the create event UI lacks an option to select an existing photo, after the event has been created there is a button at the top right "Change Event Photo" which drops down several options, including "Choose from My Photos" and "Choose from Event Photos"
Event names need to use standard capitalization and can't make excessive use of special characters. Note also the "Suggested name:" below the field. 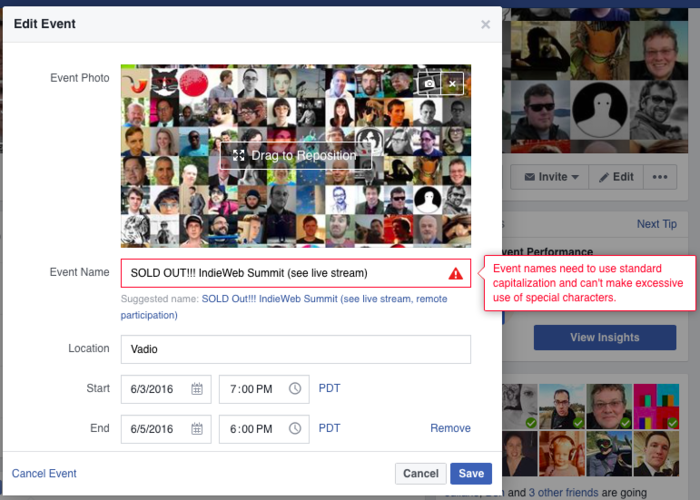 Obviously no such restrictions exist on the IndieWeb. You can name your indie events whatever you want. Thoughts on how to publish an edit of a specific property. Below is an example of updating a photo property of an h-card as discussed on IRC 2015-05-27 and iterated on github. Consumers of this post must act only on non-empty property values on the object embedded on the "p-update" property. "Aaron Parecki\r\nupdated his profile photo\r\n \r\nat 13:37"
Micropub has edits, maybe that structure could be adapted? (With the benefit that accepting an edit could be a straight-forward translation of a proposed edit to an MP-request). There are particularly common use-cases for (requesting) adding and or removing specific properties on other people's posts. As these are adding/removing entire property values (rather than just changing the content property) and thus may merit a different approach. Separate custom markup for each property and adding/removing, e.g. tag-of has u-tag-of for a simple h-entry response that adds tags to another post. New *-of properties to indicate adding or deleting the properties mentioned in the h-entry. Use u-edit-of as the response property linking to the post to edit / request changes in, with properties p-update, p-add, p-delete each with an embedded h-* object that they intend to edit. Though perhaps with a -mp- prefix to indicate literal Micropub update/add/delete semantics: p-mp-update, p-mp-add, p-mp-delete since we don't necessarily expect other uses (in other microformats) for these properties outside of edit posts. As proposed in the Edit a specific property proposal above. A very basic option (e.g. to propose a spelling correction) could be a fragmention for content selection and just the proposed replacement text. Interesting independent web example: https://remysharp.com/2015/09/14/jsbin-toxic-part-1 - hover over the post name and an (edit) link that shows up that takes you to the markdown file on github for the post where you can presumably make a pull request. This page was last edited on 27 March 2019, at 15:56.